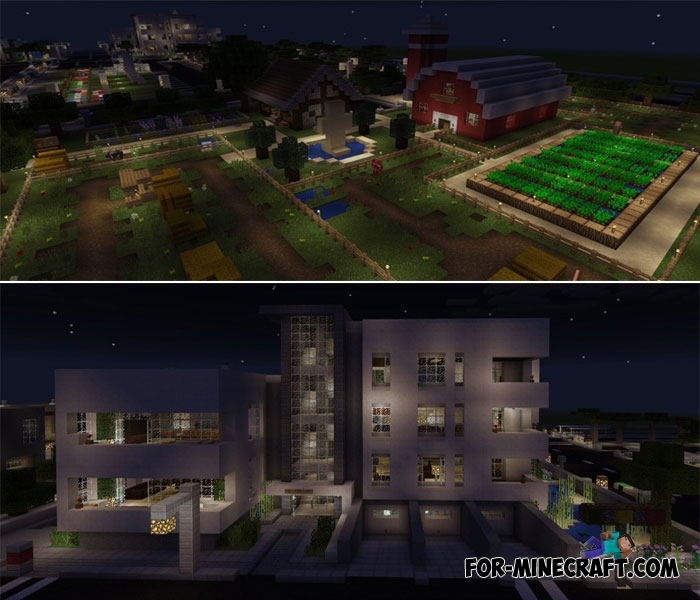 Throughout the history of Minecraft PE fans have built a lot of amazing cities which occupy large areas. Some cities have their amazing features such as coloring, height of buildings and the number of nearby villages. UKS City combines all these features with the exception of perhaps only tall buildings. But in fact this is a real city populated by hurrying and bustling residents. More variety on the streets. Added Easter eggs, start searching. Support for Minecraft Bedrock 1.2.5+. Halloween update with new themed buildings. Added new houses in a residential area. A small park was built for relaxation after work. The map continues to grow, if you have ideas then send them to the map author. I advise you to install this update if you have MCPE 1.1. The territory of the city has been enlarged, and some buildings have received new interiors. The map is suitable for both survival and creative modes, while it works perfectly in multiplayer. The next update is global and will include many new ones. UKS City consists of small streets where there are eateries, homes, theaters, train stations, stadiums, and more. This city can be your favorite MCPE map because it has everything. You just have to decorate the chosen house and just live and enjoy life.